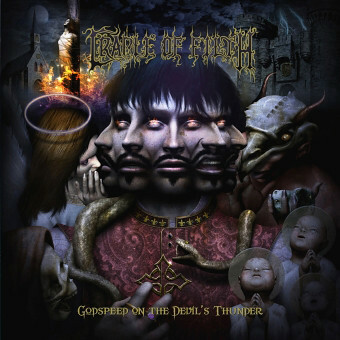 In addition to the standard version of CRADLE OF FILTH's new album, "Godspeed On The Devil's Thunder" (due out on October 28 via Roadrunner Records), there will also be a special edition and vinyl released. See below for the complete track listing. The song "Tragic Kingdom" is available for streaming at this location. "Godspeed on the Devil's Thunder" (see artwork below) is conceptual and is based on the well-documented, true-life fall from grace of a shadowy historical figure named Gilles de Rais, a wealthy French nobleman who was one of Joan of Arc's brothers-in-arms. He was best known, however, as a prolific serial killer who mixed prayers with his nightly murders as well as an aspiring alchemist. He was accused of a panoply of crimes, among them heresy, demonology and kidnapping. There's even an extreme fringe sect of historians who question de Rais' true status, with some convinced he was framed. VampireFreaks.com recently conducted an interview with CRADLE OF FILTH frontman Dani Filth and guitarist Paul Allender about "Godspeed On The Devil's Thunder". Watch the 23-minute chat below.